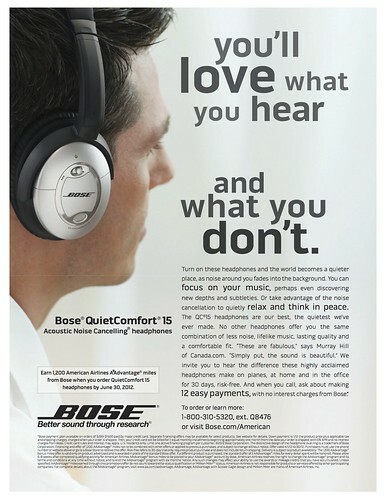 I was looking through the most recent American Way magazine and found an offer from Bose that’s better than the one you’ll find at AA.com. 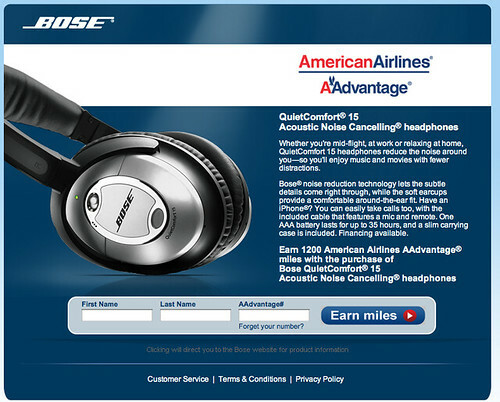 The website displays the usual 2 AAdvantage miles for every $1 spent on a Bose purchase. Here’s the better offer I found in the back of the current American Way. Earn 1200 American Airlines AAdvantage miles with the purchase of Bose QuietComfort 15 Acoustic Noise Cancelling headphones. Whether you’re mid-flight, at work or relaxing at home, QuietComfort 15 headphones reduce the noise around you—so you’ll enjoy music and movies with fewer distractions. The Bose QC15 headphone does a remarkable job keeping out unwanted noise, and they’re great for music and movies. They’re also great for sleeping. One of my favorite uses is to connect the headphones to my iPad, and then launch my favorite sleep app, Sleep from Red Hammer Software. The headphones seal out the world, and the sounds soothe me to sleep. Only the scent of a chocolate chip cookie being baked on board can wake me. But back to the Bose promo: According to the Magazine ad, the 1,200 Bonus AAdvantage Miles offer expires June 30. Go here to read the fine print or to place your order. I actually got this offer via mail, too. Not a bad offer, though I don’t think I’ll be taking them up on it!